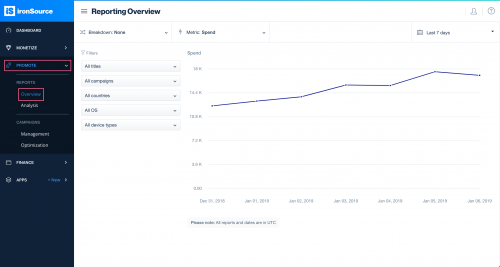 Our Overview Reports allow you to view high level trends to help you understand the performance of your User Acquisition campaigns. Slice and dice your data with various breakdowns, metrics, filters, and timeframes. Break and filter your data to find specific results and separate the data to simplify your report. Toggle between different metrics to see a dedicated graph for that metric. Choose between a number of basic, calculated, and cohort metrics. Impressions: Total number of times the ad is shown. Clicks: Total number of times users clicked on the ad. Completions: Total number of times users completed the desired action of the campaign. For example, the completion for CPI campaigns is the install, and the completion for CPE campaigns is the event completion. Installs: Total number of new app installs received (the user must download and open the app). CTR (Click Through Rate): Clicks divided by impressions. CVR (Conversion Rate): Completions divided by clicks. eCPI (Effective Cost Per Install): Spend divided by installs. This represents the average CPI for the measured timeframe. eCPA (Effective Cost Per Action): Spend divided by completions. This represents the average CPA for the measured timeframe. Ad revenue: The amount of revenue generated from users viewing ads in your app. IAP revenue: The amount of revenue generated from users making purchases in your app. Total revenue: The sum of Ad revenue and IAP revenue. ARPU: The average revenue generated per user within the defined cohort range. Calculation: Total Revenue from Day 0 through Day X divided by installs on Day 0. ROAS (Return On Ad Spend): The percentage of total revenue generated within the defined cohort range out of total campaign spend. Calculation: Total revenue from Day 0 through Day X divided by the total spend on Day 0. Unique Purchasers: Installed users who have also completed an in-app purchase within the defined cohort range. Purchasers rate: The percentage of new users who have made an in-app purchase within the defined cohort range. Calculation: Unique Purchases from Day 0 – Day X divided by installs on Day 0. Retention: The percentage of users that return to your app on a specific day after their first app launch within the defined cohort range. Calculation: Retained users on day X divided by the number of new installs on day 0. Cohort: Defines the time span in which to analyze users based on when they installed your app and triggered an app launch. D0 is considered the first day the user opened the app. You will thus be able to track user activity and how users develop over time from the day they installed your app within this timeframe. We currently support the following cohort ages – D1, D3, D7, D14, D30.